This is a guide to the rail links between Italy and the rest of Europe - so you can plan your journey by aiming for the most convenient crossing point. There are surpris­ingly few rail links between France and Italy. From the cyclist's perspective the most useful link is the line that runs along the coast between Nice and Ventimiglia. The local trains run by the Principality of Monaco. There's space for a couple of bikes on each train. There are also services operated by thello between Marseille and Milano (thello.com: Marseille-Milano timetables). These are for people with bikes in bags only. Note that the maximum permitted size for bike bags is 80x110x40 (see thello.com: luggage on the Marseille-Milan day train. 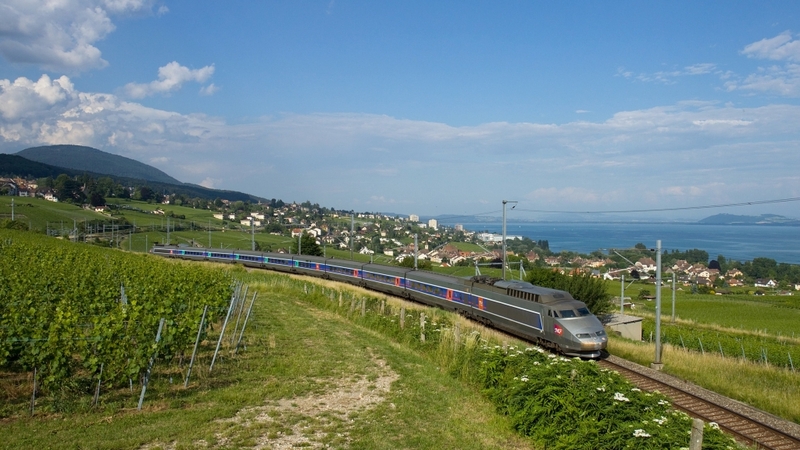 There's a TGV service between Paris and Torino (limited to bikes in bags only). There are three trains a day, in the early morning, mid-morning and early afternoon. The journey takes about five and a half hours. Amazingly, there are no local trains along the line - the TGV is the only cross-border service. There's also the service between Ventimiglia and Cuneo via Tende in France, that's operated by trenitalia. There is currently only a restricted service on this line with a couple of trains each way (from Ventimiglia there's one at 10:37 and another at 18:37). The trains have space for a couple of bikes. The TGV-Lyria services from Paris mean that Switzerland offers a poten­tially extremely useful gateway to northern Italy. If you catch the TGV-Lyria that leaves Paris just after 9am you can be in Milano by late afternoon (taking the 13:42 train from Genève which arrives at Milano Centrale at 17:35). The Genève and Basel services both use the Simplon tunnel. There are two other gateways to Italy: the Gotthard tunnel and the Ferrovia Retica between Tirano and Sankt Moritz. A new tunnel (the Gotthard Base Tunnel is due to open in 2016 and will offer faster journey times. There are relat­ively frequent trains from Luzern to Milano via Bellinzona or Lugano and Chiasso. (You can of course cycle into Italy from either Bellinzona or Lugano. It's worth noting that a number of these services involve the Intercity tilting trains (shown with the initials ICN) on the timetables. Bike reser­va­tions are compulsory on these services between 21 March and 31 October (reser­vation charge: CHF 5). At Lugano, or Bellinzona you connect with one of the trains operated by the TILO company. TILO is a joint venture between trenitalia and the canton of Ticino. It operates services between Milano and cities in the Ticino canton of Switzerland (Locarno, Lugano, Airolo). Its S30 line links to Milano's Malpensa airport. Some S20 trains run to Domodossola. The third connection is the Rhätische Bahn (RHB) (Ferrovia Retica in Italian) who operate trains between Sankt Moritz and Tirano in Italy. They are best known for the panoramic Bernina Express. You can't take bikes on the Bernina Express but you can take bikes on other trains operated by the company on that line. The altern­ative trains are just as scenic. If you are travelling from certain countries you may be able to buy an inter­na­tional bike ticket. These are available in Belgium, Denmark, Germany, Luxembourg, Netherlands, Austria, Poland, Slovakia, the Czech Republic and Hungary. The inter­na­tional bike ticket is valid from the point of departure to the destin­ation on your own passenger ticket. Note however, that you will need to buy a bike ticket for the Italian section of your journey. If you need to reserve a place for your bike this will cost 5 CHF. The inter­na­tional bike ticket includes one reser­vation. The major link between Italy and Austria (and Germany) is via the Brenner Pass. 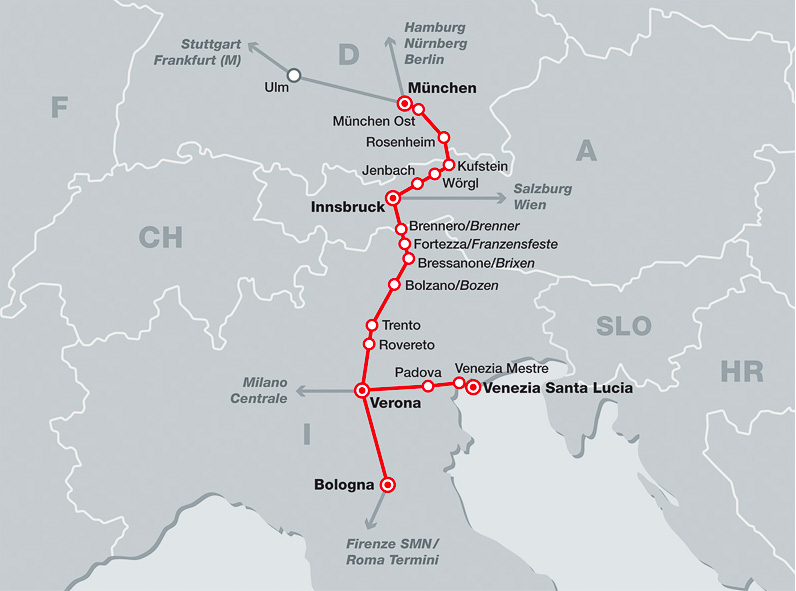 The main operator on these lines is a joint venture between German Austrian and Italian railways who run the Eurocity service between Munich/​Innsbruck and Verona/​Bologna/​Venezia. The Eurocity services are easily the most bike-friendly inter­na­tional connec­tions into Italy. The service is now even more bike-friendly: according to the 2018 timetable leaflet all of their trains now have space for 16 bikes. Note that you have to book bike places and you can't make bike reser­va­tions online - you need to call one of their call centres, or go to a station - there's also a very helpful office in Verona Porta Nuova station. 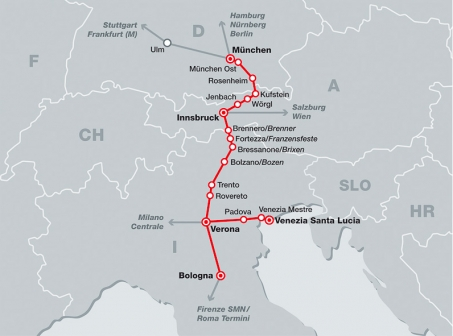 There is a second rail link between Villach in Austria and Pontebba in Italy - the line continues on to Venezia Mestre. ÖBB (Austrian Railways) offer services on this line. However, most of the train services between villach and Udine seem to have been replaced by buses - although there are still a couple of regional services each day. ÖBB also operate a sleeper service but you can only take dismantled bikes in bags. My map of the European rail network shows a rail line between Sežana and Monfalcone via Villa Opicina. It looks like the train services have been replaced by bus services but you could head for Nova Gorica which is just over the border from Gorizia in Italy.